Getting there: The entrance to Reed Park lies on Pecos Street in Tarrytown. To get there take the 35th Street exit off of MoPac and head west. Turn left on Pecos Street and head south. If you run into Balcones Drive on 35th Street you've gone too far. The entrance to the park will appear on the right, after passing River Road. Drive to the back of the parking area, near the lime kiln, in order to be close to the trailhead. The Hike: Reed Park is a small park in the heart of Tarrytown that provides a wealth of activities for residents. The park includes a playground, picnic area and a swimming pool. We're more interested in history and hiking and Reed Park provides plenty of that too. Near the start of the hike, just across the driveway stand the remains of Taylor's Lime Kiln, which was used in the 1800's to produce quick lime for making cement used for the construction of stone houses. Later in the hike the trail will pass near a rail car system that was used to carry limestone material to the kiln. 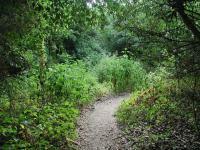 The packed dirt trail is easy to follow and covered by heavy foliage, with a few sunny spots. Our hike today begins at the waypoint marked "Trailhead". The path leads towards the back of the park and soon comes up one of several creek crossings. None of the crossings on this trail are particularly difficult and the chances of getting wet are non-existent unless there has been a large quantity of rain recently. But rain alone does not determine the level of the creek. We've hike along this trail on two successive days with no rain for weeks and the water on the second day was much higher. We suspect runoff from neighborhood lawns and drainage from the park pool to be the source. The smell of chlorine in the water was evidence of the later. Soon after the first creek crossing the trail develops a thick foliage that will remain through the turnaround point. Poison Ivy is prevalent along the trail, though not right in one's path. When walking along the edge of the trails for whatever reason be on the lookout for poison ivy and avoid it if you do not want to ruin a good outing. 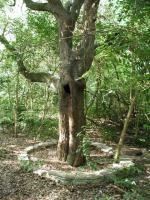 Several of the trees in the old garden area are encircled by a low wall. 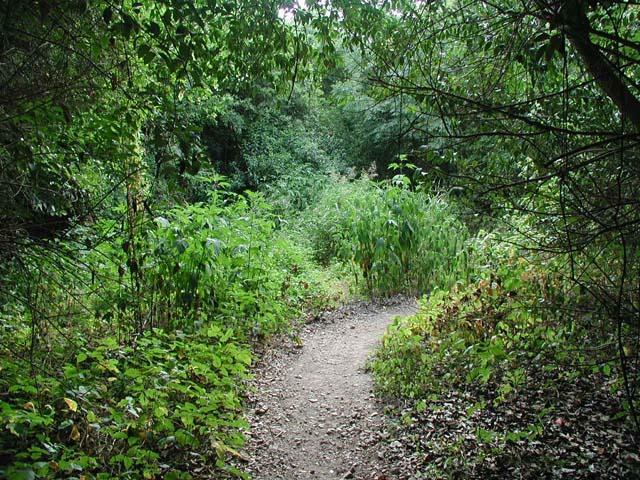 There are a couple of side trails that meander off from the main path, though most do not go very far and usually just go to the creek bed to the right. One exception is a side trail that leads to the waypoint "Landscaping". This is an area of the park that must be seen. Here one can find numerous structures that indicate the area was a garden retreat many years ago. A concrete staircase leads up the hill slope. With tree limbs blocking the way it's obvious that the stairs have not been used in many years. Small stone walls surround select trees. 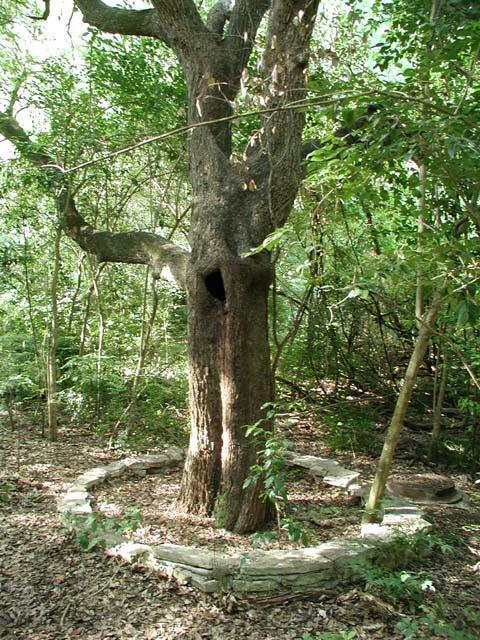 The remains of electrical wiring in one of the trees indicate that someone at one time ran lights into the trees, providing an effect that must have given the area a magical quality. Hidden in some of the brush is a bench made out of a large rock and even a large patch of what appears to be Aloe Vera plants. Along the creek the remains of a stone wall stand guard. We have no idea who put this here or when. Nature has largely taken over, but you can still make out the tree circles and the staircase to the left in the old garden. One note about the secret garden area. Homes line the top of the ridge at this spot. We cannot state strongly enough how important it is to not trespass onto these homes. To take things a little further we recommend that you stay away from the top of the ridge altogether so as not to alarm residents who may see strangers poking around their fence line. The interesting stuff is below the top of the ridge anyway. Shortly before turnback point of the trail the path enters a section of foliage cover that is choked by vines. The vines seem to be everywhere and provide a slightly otherworldly appearance to the area. 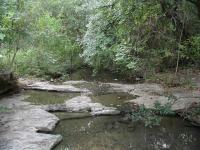 To the right, the creek's bed begins to widen as it gets close to Lake Austin with some thickly vegetated marshes. Near the turnaround point, remnants of the support infrastructure for Taylor's Lime Kilns can be found. The turnaround point is marked by waypoint "Turnaround". Here the trail runs into Scenic Drive and private houses are situated on the other side of the road blocking access to the lake shore. However, if you venture slightly up the street you'll be able to get to the shore of a small inlet from Lake Austin that is not on private land. While you're here, you might as well continue up Scenic Drive to the waypoint "Rail Car". Here you'll find the remains of the rail car system that was used by the Lime Kiln near the trailhead. 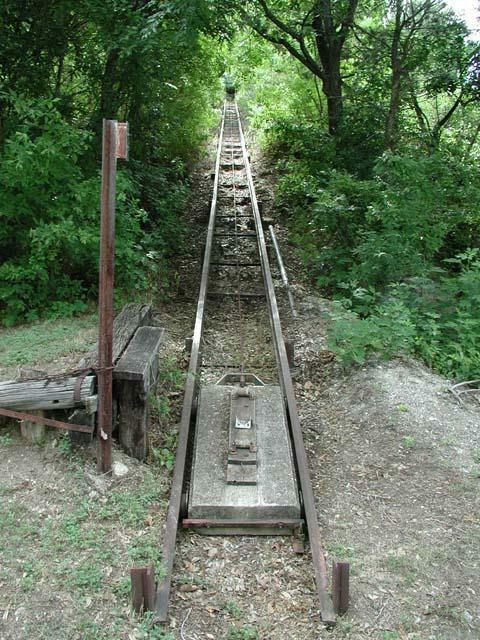 An iron rail leads up the hill where a lone car sits at the top. The only elevation gain on this hike would come from following the rail up the hill to the car. But be aware that the top of the rail runs into someone's backyard, so be respectful and keep your distance. In the past quarried lime was carted up the hill here to a point at roughly the same elevation as the top of the lime kiln. From there the limestone was probably carted on a horse drawn wagon. At this point we headed back the way we came and worked our way to the trailhead. In total this hike was only about half a mile with negligible elevation gain. So it's ideal for tackling in the summer months when the heat limits time spent outside. I was petsitting by this park so I thought I would try it out. Glad I didn't make a special trip to the park from a long way away! The park has a great playground and a pool (though the water was gone). It is the site of an old kiln. The history of the park was actually pretty cool. The trail was boring at best but it did keep me entertained for awhile which was nice! 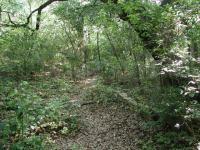 I found this hike when looking for something easy for a relative who has trouble walking. It was ideal for those circumstances -- pretty flat, pretty straight, lots of wildflowers. My only complaint was the multitudes of mosquitoes that attacked us at 9 in the morning. However, despite how nice this hike was, it would have left something to be desired for anybody with *any* hiking experience. Reed Park is a quiet neighborhood park, and the trail runs from the pool area along a creek (dry today) to Scenic Drive near Lake Austin. It crosses the creek in several places, so if it has been raining, you may get wet. Didn't find the trail to the secret garden area, though. Although the hike is short, it is very convenient and includes the opportunity to observe Taylor's Lime Kiln.